This one is called “I’m a Big Boy.” I cast on in the middle of a swatch of green, and I’m afraid when I turn the band up, all the pretty blue will be hidden. Next time I’ll cast on in a swatch of blue and see what happens. Yes, I used circular needles, even though I’m not knitting in the round. I find the shorter length circulars are ideal for travel. If you drop a needle, it stays attached to the other one. Sometimes, I ball up my yarn and pop it, along with a set of circular needles and those tiny folding scissors, in a zip top sandwich bag. Then I pop it in my purse and I’m set to go. Whenever I’m stuck in a waiting room or other slow place, I can be productive and pass the time. 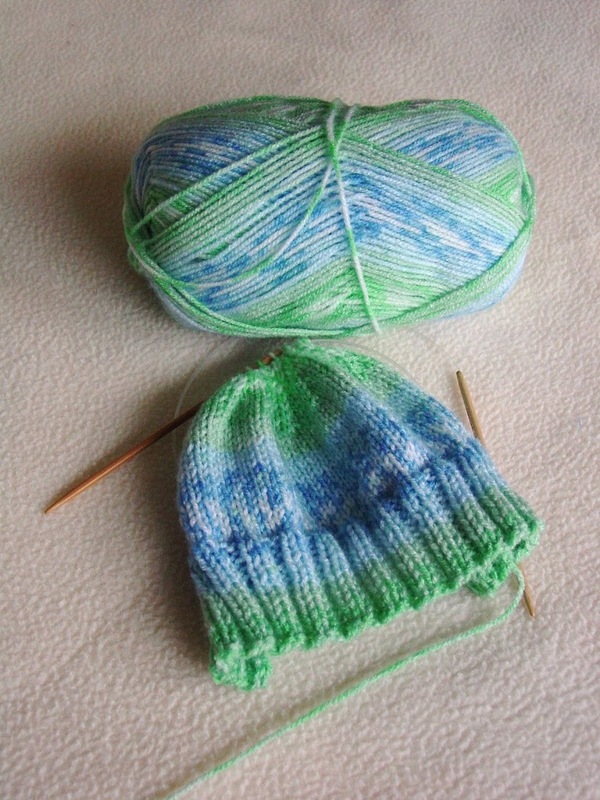 I do knit my baby caps in the round from time to time, but I’m not crazy about finishing with double pointed needles, especially when I’m travelling. 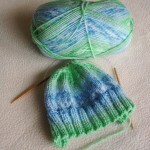 Filed under baby caps, knitting, knitting needles, travelling, yarn |	Comments Off on Another Baby Jacquards!